In this paper we consider the problem of computing the minimum expected time to reach a target and the synthesis of the corresponding optimal controller for a probabilistic timed automaton (PTA). 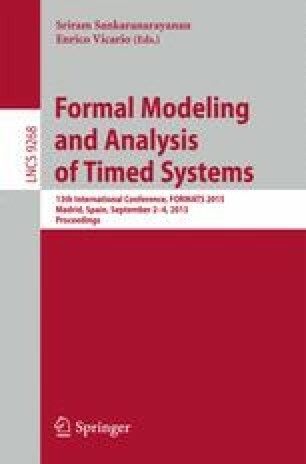 Although this problem admits solutions that employ the digital clocks abstraction or statistical model checking, symbolic methods based on zones and priced zones fail due to the difficulty of incorporating probabilistic branching in the context of dense time. We work in a generalisation of the setting introduced by Asarin and Maler for the corresponding problem for timed automata, where simple and nice functions are introduced to ensure finiteness of the dense-time representation. We find restrictions sufficient for value iteration to converge to the minimum expected time on the uncountable Markov decision process representing the semantics of a PTA. We formulate a Bellman operator on the backwards zone graph of a PTA and prove that value iteration using this operator equals that computed over the PTA’s semantics. This enables us to extract an \(\varepsilon \)-optimal controller from value iteration in the standard way. This research is supported by ERC AdG VERIWARE.